A-HOTEL.com - Luxury and cheap accommodation in Makovo, Russia. Prices and hotel, apartment booking in Makovo and surrounding. Featuring an outdoor pool, Holiday home Lebedevka is a detached holiday home set in Lebedevka in the Leningradsky Region. Guests benefit from terrace. Offering a garden, Cottage Complex Svetloye offers pet-friendly accommodation in Svetloye, 85 km from Saint Petersburg. Free private parking is available on site. Featuring a spa and wellness centre with a sauna, hammam, hot tub and fitness centre, Krasnoye Ozero Resort is situated in the picturesque area of Korobitsyno. The holiday homes offer a sauna, TV and kitchenette equipped with a fridge, stove and electric kettle. Country House Svetloye Venue is located in Svetloye. The property was built in 2017, and has accommodation with free WiFi. Set in Svetloye, Country club Dachniki provides accommodation with free WiFi and access to a garden. Each unit comes with a seating area, a flat-screen TV with satellite channels, a well-fitted kitchen, and a private bathroom with free toiletries. Medoviy Dom offers accommodation in Korobitsyno, 2 km from Red Lake Ski Resort 2 and 2 km from Red Lake Ski Resort 1. The Red Lake Ski Resort 5 is within 2. Cottage Alpiyskiy domik, a property with a terrace, is situated in Korobitsyno, 2.6 km from Red Lake Ski Resort 2, 2. Within a few steps of Golden Valley Ski Centre Ski Lift 1 and 50 metres of Golden Valley Ski Centre Ski Lift 2, Korobitsyno Kaskad Apartments offers free WiFi and ski-to-door access. This apartment is 100 metres from Golden Valley Ski Centre Ski Lift 3 and 100 metres from Golden Valley Ski Centre Ski Lift 4. Dacha Svetloye is set in Svetloye and offers barbecue facilities. Guests staying at this country house have access to a fully equipped kitchen. Featuring an outdoor pool and a sauna, Country Club Trava Holiday Park is located in natural surroundings in Michurinskoye. It offers comfortable self-catering accommodation with free WiFi. Set in the picturesque area of Korobitsyno, Snezhny Resort features a sauna and free private parking. The rooms come with a kitchenette and a flat-screen TV with satellite channels. 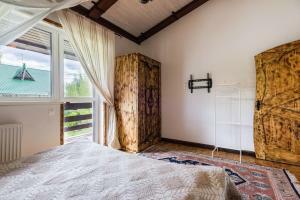 Set in Korobitsyno, Shale Sovushkino Gnezdo offers accommodation with a flat-screen TV and a kitchen. There is a fully equipped private bathroom with bath and free toiletries. Offering a restaurant, this property is located on the territory of Zolotaya Dolina Ski Resort, 2 km from Korobitsyno Village. Free WiFi access is available in this holiday park. Offering a sauna with hammam, Korobitsyno Kaskad Resort is located in a picturesque area, 3.5 km from Lake Krasnoye. Surrounded by greenery and pine forest, Korobok-Khutorok is located in the village of Korobitsyno, 2 km from Lake Krasnoye. Free WiFi access is available. Offering barbecue facilities and a terrace, Cottage Neptun is situated in Korobitsyno, 4 km from Lake Krasnoye. Guests have a private balcony. Zimnyaya Skazka features a seasonal outdoor swimming pool, as well as accommodation with a kitchenette in Korobitsyno. Complimentary WiFi is available. Located a 5-minute walk from Lake Pravdinskoye in Silino, Eco Village Club offers a private beach area and a sauna. Free private parking is available on site. Providing barbecue facilities, Cottage Chalet features accommodation in Korobitsyno. The accommodation features a sauna. Offering a barbecue, Smart na Gore is set on the mountain side in Korobitsyno. Snezhny Resort is only 100 metres from Smart na Gore Korobitsyno, while Zolotaya Dolina Resort is 500 metres away.